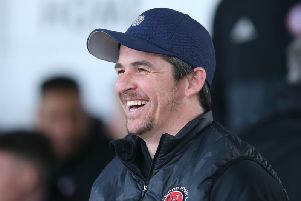 Joey Barton feels the pressure is off his Fleetwood side as he called on the Cod Army to aid their play-off push. Barton’s men were roared on to victory by 447 travelling fans at Accrington’s Wham Stadium last Saturday. And Barton wants more of the same when they return to Highbury tomorrow to host relegation-battling Southend. Barton said: “We had a fantastic away following at Accrington. They were outstanding and gave the lads a boost. “There was talk of that in the camp this week – just how pleased the players were with the fans who travelled across. “Hopefully we can create that sort of atmosphere against Southend because the lads have shown they lift and raise their game to match the passion and enthusiasm of our fans. Town are four places and eight points behind Doncaster Rovers, who occupy League One’s final play-off spot and have played a game more. Town have seven matches left and have won their last two, against Plymouth and Accrington. Barton said of his side’s promotion hopes: “We knew it was a long shot in terms of the way the season has panned out. We knew we were not favourites for it and we are still not favourites. “But I think we are in a no-pressure situation, where it would be a real surprise to everyone if we did get it. “Doncaster are sitting with the points on the board but we have an opportunity to put that right with a game in hand. “We have some difficult games but while it is still there we still believe. We are coming into form at the right end of the season. “The difficulty for us is that we cannot take our eyes off the prize. If we start thinking about what is beyond Saturday and we lose focus, then we won’t get the points we need and that will be it. “The key for us is one game at a time. That was the mindset going into Plymouth and Accrington, and we managed to come out of those games with maximum points.